Which Perennials Can I Plant Now? Now that it’s finally spring, we have Brunnera, Aquilegia (‘Little Lanterns’ above) and Pulmonaria ready for you and your customers! Our spring crops of these early perennials are already rooted and just need a few days of warmth for some fresh foliage to appear. Brunnera (Bugloss) is a nice, low foliage plant with its heart-shaped leaves looking great all season, and its spring flowers that look like forget-me-nots are an added bonus. Aquilegia (Columbine) has a delicate lacy leaf, with flowers bobbing on stalks above the mound of leaves. 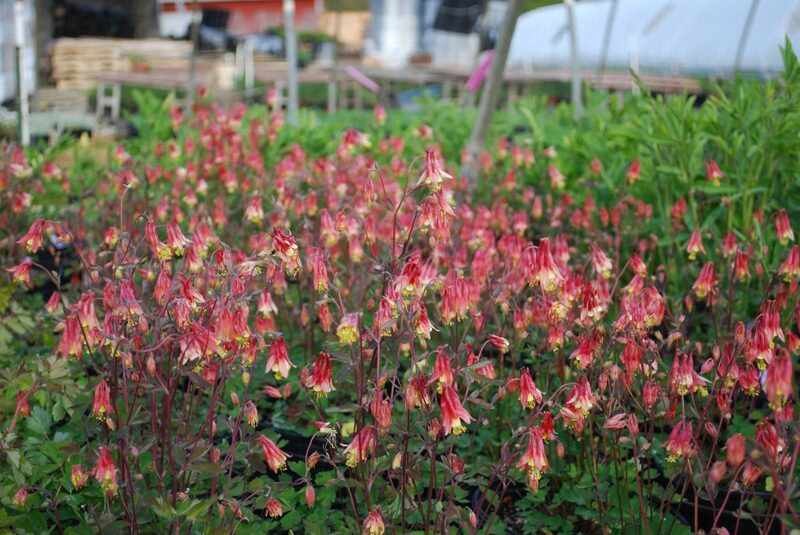 A. canadensis and its dwarf version ‘Little Lanterns’ are native, the quintessential old-fashioned Columbine from grandmothers’ gardens, and a favorite of hummingbirds. Other varieties are available in different shapes and colors. Pulmonaria is another low foliage plant, with a bonus of pink to lavender spring blooms. The different varieties available display different markings on the leaves, as well as some variation in the flowers. Come and take a look! These and others offer the early color that any client would appreciate in the landscape!